The SNP Westminster leader is calling for Scottish Labour MPs to support a second referendum. 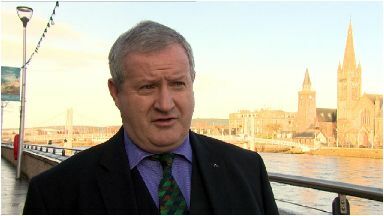 Ian Blackford also warned in his letter that supporting Jeremy Corbyn's EU withdrawal proposals would serve a "devastating blow" to communities across Scotland. He said Scotland voted to remain and that the "nation must not be dragged out" against its will. Mr Blackford added: "We are less than 50 days away from Brexit date and in Westminster both the Prime Minister and leader of the so-called opposition are leading Scotland and the UK hand in hand off the Brexit cliff-edge. "When the Prime Minister returns to Parliament with her deal, Scottish Labour MPs must stand up for Scotland's economic and social interests, and reject the Prime Minister's deal and Jeremy Corbyn's plan to throw his support behind it. "It is alarming that, despite the overwhelming damage that the Prime Minister's deal will cause to Scotland, the Labour leader would seek to support the deal. Scotland did not vote for Brexit and our nation must not be dragged out of the EU against our will. "I call on Scottish Labour MPs to reject the Prime Minister's deal, support the SNP's calls for an extension to Article 50 and back a second referendum on EU membership." Shadow Scottish secretary Lesley Laird said that Labour remain convinced that the best outcome is a general election to get rid of the current Tory Government. In a letter replying to Mr Blackford she said: "As you are aware, we have put forward a proposal that is based around a permanent and comprehensive customs union with a say in future trade agreements, close alignment with the single market underpinned by shared institutions, dynamic alignment on rights and protections to ensure that standards in the UK do not fall behind those of the EU, participation in EU agencies and continued collaboration on security issues." She added: "Jeremy Corbyn's letter to the Prime Minister this week makes clear our unequivocal opposition to a no-deal Brexit, the Prime Minister's current deal or any tweaked version of it, a CETA style deal or any deal that could lead to a hard border in Northern Ireland. "To suggest otherwise, and that we are somehow enabling a Tory Brexit, is not just disingenuous it is an outright fabrication and political opportunism of the worst kind." She went on: "Brexit presents many challenges for Scotland and the UK. The decisions that we make in the next few weeks will have a profound impact on our constituents for many years to come. "Labour is, just as we have always done, seeking constructive solutions that unite people rather than foster further division."